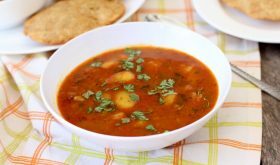 Bedmi aloo sabzi recipe is a deceptively simple to make comforting thin gravy or watery potato curry. This particular type of potato sabji is very popular in Northern India especially the street vendors who sell chaat, kachoris, bedmi puri and puri. It is also known as ‘dubki aloo’ which means chunks of softened, spice soaked potatoes dunked in a flavorful runny sauce or curry. In fact, its a treasured Indian regional food dish and is a signature dish of Mathura’s (Lord Krishna’s birth place) street food fare. 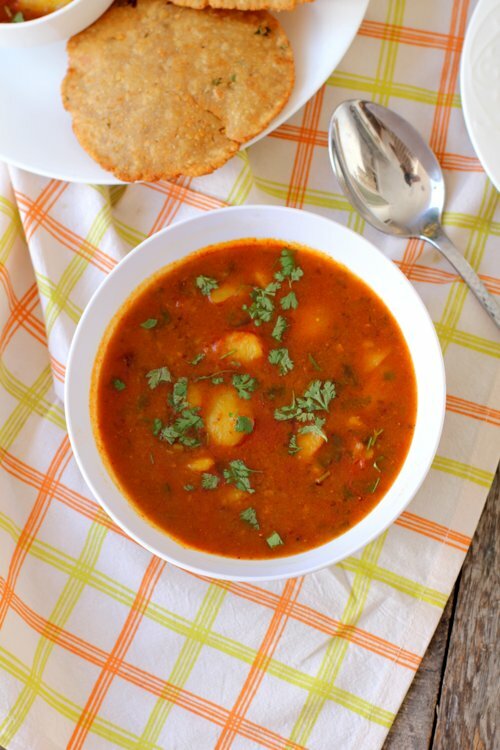 Mathura ke dubki wale aloo is served with bedmi puri, urad dal kachori, puri or paratha. Infact it is a no onion no garlic recipe, super quick to make provided you have some boiled potatoes on hand. 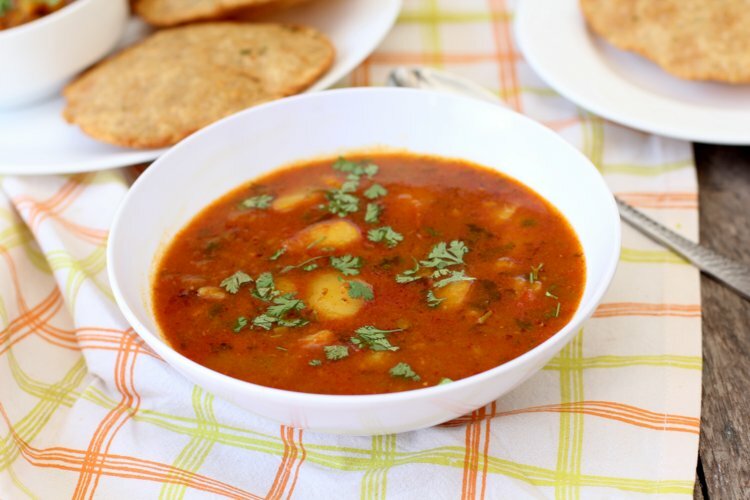 Usually tomatoes are not used in the authentic bedmi aloo sabzi recipe but few home cooks add tomatoes for more flavor. If you are making this dubki aloo recipe, do make sure you use green chilis, ginger, garam masala and fresh coriander leaves. They add oodles of flavor to the simmering curry making it addictive. Its no exaggeration that this humble bedmi aloo is one of the best vegetarian dish of Uttar Pradesh cuisine. A gem among potato sabji recipes and one that should be added to your recipe repertoire. If you are a fan of potatoes and looking out for North Indian style aloo recipes, do check out banarasi aloo matar sabzi, aloo sabzi for kachori, aloo matar sabzi, aloo rasedar and tamatar aloo sabzi. Heat oil in a heavy bottomed vessel, once hot, add the fenugreek seeds and allow to turn red. Add the cumin seeds and asafoetida and saute for few seconds. Add the green chili and ginger paste. Saute for few seconds. If using tomatoes, add them at this stage. Place lid and cook the chopped tomatoes on low medium flame for 7-8 mts. Add the turmeric powder, red chili powder, coriander powder and salt and mix. Add the boiled potatoes chunks and give a stir. Add 4 cups of water and salt and bring to a boil. Place lid and cook on low medium flame for 12-15 mts. Add amchur powder and garam masala powder and mix. Turn off flame. Add the chopped coriander leaves and mix. 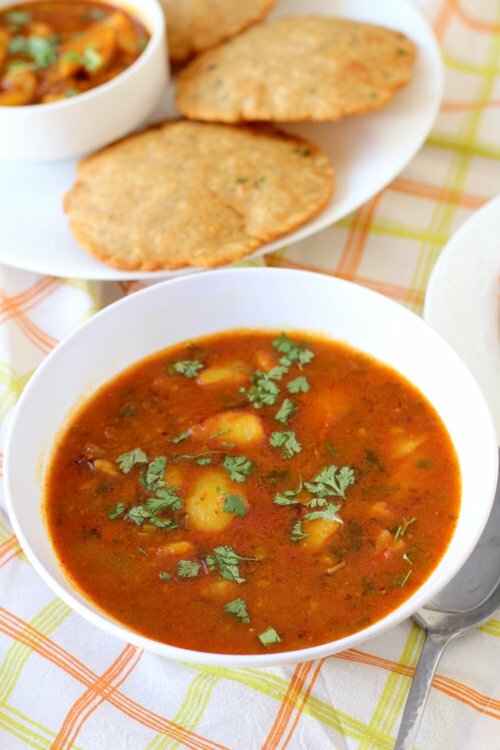 Remove to a serving bowl and serve with bedmi puri, khasta kachori, puri or paratha. You can use a tbsp of ghee and 2 tbsps of oil. Vegans can avoid ghee. Tomatoes are not essential, but you can add one or two either finely chopped or pureed. If using sour tomatoes, amchur can be omitted. For a more runny or thin gravy, add more water. By Sailu Published: December 17, 2015 Bedmi aloo sabzi recipe, a gem among North Indian potato bhaji recipes, is a runny masala potato curry served with bedmi puri. A no onion no garlic recipe. Oh my mouth is watering.